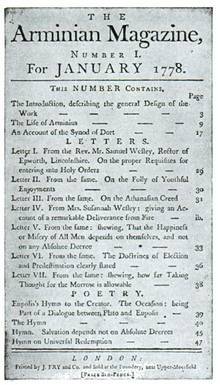 In the summer of 1777, John Wesley drew up a basic sketch of his idea for what would become The Arminian Magazine. The excerpt below is from a document containing some of his initial ideas and the impetus for his idea for creating the magazine in the first place. Here are the first three paragraphs exactly as they were written by Wesley to those who might be interested in reading his new magazine. 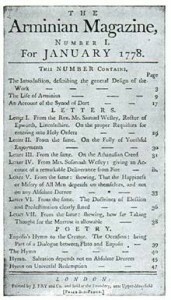 Amidst the multitude of magazines which now swarm in the world, there was one, a few years ago, termed The Christian Magazine, which was of great use to mankind, and did honour to the publishers. But it was soon discontinued, to the regret of many serious and sensible persons. In the room of it, started up a miscreated phantom, called The Spiritual Magazine; and, not long after, its twin sister, oddly called The Gospel Magazine. Both of these are intended to show, that God is not loving to every man, that His mercy is not over all His works; and, consequently, that Christ did not die for all, but for one in ten, for the elect only. This comfortable doctrine, the sum of which, proposed in plain English, is, God before the foundation of the world absolutely and irrevocably decreed, that ‘some men shall be saved, do what they will, and the rest be damned, do what they can,’ has, by these tracts, been spread throughout the land, with the utmost diligence. And these champions of it have, from the beginning, proceeded in a manner worthy of their cause. They have paid no more regard to good nature, decency, or good manners, than to reason or truth. All these they set utterly at defiance. Without any deviation from their plan, they have defended their dear decrees, with arguments worthy of Bedlam, and with language worthy of Billingsgate. Okay, now it’s your turn. Comment below. What do you make of Wesley’s critique of the theological idea of damnation by divine decree? Agree? Disagree? Modified view? Caveats? What? 1. Copied verbatim from: Tyerman, L. (1871). The Life and Times of the Rev. John Wesley (Vol. 3, pp. 281–282). London: Hodder and Stoughton. 2. From Wesley, J. (1872). The Works of John Wesley (Third Edition., Vol. 7, p. 383). London: Wesleyan Methodist Book Room. 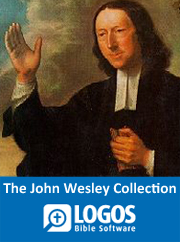 Learn more about John Wesley here. I remember Calvinist relatives using Romans 9: 10 – 13 to proof text that God chose salvation for some and not others. Rather than understanding the Greek word translated as hate in most texts in relationship to Esau, also translates as – did not prefer, that text is used to prove God chooses to bring some to salvation and not others, that God hates certain persons. Yet, since All scripture is given by inspiration of God, we must consider all scripture concerning Esau when considering if he is the proof that God hates certain people. In an accurate reading of the accounts of Esau, it is easy to see that the Lord did not with hold favor from Esau. His wealth is huge, he is referred to as a better man than Jacob, yet the Lord chose Jacob to be in the lineage of Messiah. Perhaps as with so many other men and women in Messiah’s lineage, to prove that God functions through the weak – because it is His strength that prevails. Rather than proving God’s choice of Jacob is proof that God saves some and not others, it proves that though we are weak God will choose and use us. On another note, it would be a wonderful blessing if the theological leaders in the world today would be a bit more like JW – nothing would prevail upon them to return evil for evil. Thanks for chiming in. I wholly agree with the conclusion that God’s decision to continue the world-saving project through Jacob means that God preferred to do it that way. He would be the one through whom the line moved forward toward Messiah. In any case, I have always had a problem with the idea of “individualized election” such as is found in the system(s) the emphasize election of individual persons to salvation, and other to damnation. In other words – the whole purpose of God’s election of Abraham was not so that God could show Abraham that he was chosen because God loved him and hated everyone else, but rather – God loves everyone, and wants to express his love and desire to bless ALL the nations by beginning with one person, and extending that blessing to the rest of the people. “This affects the way we understand the whole biblical doctrine of election. There is a tendency to speak of it solely as a doctrine of salvation—that is to say, the elect are those who get saved. That then leads to all kinds of controversy through the centuries as to whether God is fair in choosing some to be saved and not others. I don’t want to get bogged down in that ancient but still potent debate. All I want to point out here is that the first time we really see God choosing and calling someone—i.e., putting election into action—it is precisely not so that Abraham and his family alone get saved, but rather that by being blessed he should become the agent of blessing to others.Election of one is not the rejection of the rest, but ultimately for their benefit. It is as if a group of trapped cave explorers choose one of their number to squeeze through a narrow flooded passage to get out to the surface and call for help. Wright, C. J. H. (2010). The Mission of God’s People: A Biblical Theology of the Church’s Mission (p. 72). Grand Rapids, MI: Zondervan. I’m a Calvinist. I used to promote Arminianism/semi-Pelagianism. I make no apologies and could, if I chose to, address each of these points below. (I just found this website four years late). But what would be the point? We read the same texts and come to different conclusions. I believe Wesly was dead wrong. I too can bring to bear some of the finest Reformed theologians as well & what I have learned along the way & years. I doubt this would change anyone’s mind. So, let us be gracious to each other. Let us share Christ w/ the lost in the power of the Holy Spirit & leave the results to God. Amen & semper fi.